You might say Samantha was the poster child for empty-nest syndrome. She and her husband Darren had raised three lovely children all of whom had left home over the last several years. Darren still worked so Samantha was left alone in the house all day a prisoner really of her own imagination. She tried to keep active. Since there were just the two of them there wasn't much need for housework. She kept things tidy but it didn't require much effort or time. So she filled her days with volunteering and yoga several times a week. And she was always home in time to prepare a nice dinner for Darren. One day, as she was surfing the net between yoga classes and work at the animal shelter she came across an ad for a pastime she thought might be interesting. Cooking classes. All that was required on her part, oddly enough, was a dark cloak and a pointy hat. That didn't seem like much for all the friendship and learning that was promised in the ad. 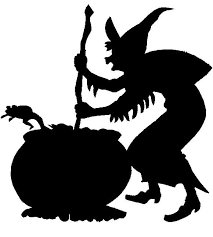 Although she was sort of mystified by her new friends' preoccupation with the phrase "double, double, toil and trouble" as they prepared their meals, how they liked to call each other "my pretty" and that the cooking instructor kept flying monkeys as pets. Nevertheless after several weeks Samantha was quite enthralled by how she had mastered her new pastime. And proficient. She could hardly wait to show Darren what she had learned. For the first time ever she donned her cloak and hat at home that night and waved her broom as she prepared dinner. Without her physically holding anything the ingredients for supper magically lifted off the counter and mixed themselves in bowls then jumped in the air to pots and pans on the stove. About midway through this magical effort of flying food Darren arrived home, entered the kitchen and screamed "Sam, what on earth is going on?" To which Sam replied "I'm just putting into practice what I learned at bewitch class." "Be witch?" said Darren. I was happy with be wife. The folks at Two Word Tuesday provided the prompt of bewitch/enthrall this week. No wiggling of the nose was involved in this week's post. Poor Darren, always a muggle. You know, I had to Google muggle. But he was magical in his own way. I actually laughed out loud at this one. Well played, John! Good, good. Did you chuckle in black and white or in colour?